Orangutans are three extant species of great apes native to Indonesia and Malaysia. The Bornean orangutan is a critically endangered species, threaten by deforestation, palm oil plantations and hunting. Orangutans that had previously been orphaned or rescue from captivity are currently thriving , breeding and roaming freely at the Semenggoh Nature Reserve with usual visits to the Wildlife Centre for free meals. Visitors can watch these semi-wild orangutans in their natural habitat here. The entrance to the Semenggoh Wildlife Centre. Since this is a orangutan rehabilitation and wildlife centre with semi-wild Orang Utans, there is no guarantee you can see all the Orangutans available in the reserve. There will be time that you don’t see them at all during your visits. The Orangutans usually roaming freely in the forest but will usually returns to the feeding area for food during feeding time in the morning or afternoon. Weather conditions (rain or storm) and fruiting seasons (when there is plenty of wild fruits in the forest around November to March) will cause them to less appearance for free food at the feeding area. During the non-fruiting season (April to October), visitors have greater chances of seeing orangutans coming out to feed at the feeding area. The welcome banner for visitors to the Semenggoh Wildlife Centre. Like other great apes, orangutans are highly intelligent species with ability to use tools and share approximately 97% of their DNA with humans. In Sarawak, orangutans are listed as a Totally Protected Animal under the Wild Life Protection Ordinance, 1998, and are listed in the CITES, Appendix 1. Camera for photography, you don’t usually have chance to see Orangutans roaming around. Avoid Umbrellas and tripods. Long umbrella and tripods might be mistaken by Orangutans as hunting weapons when you pointing them. Mosquito repellent. It is a jungle out there with varieties of wildlife including insects. Sunblocks may be helpful. Cash for merchandise and entrance tickets. There is no ATM machine around the natural reserve. Long sleeves, long pants or trekking suit. If you wish to walk a distance into the jungle to see the Orangutans in the wild. Proper trekking attire for visitor interested to involve in guided jungle trekking in the Semenggoh Nature Reserve. There is two natural trails in the reserve – Brooke’s Pool Trail and Masing Trail. Interested visitors need to register at the centre’s office. Watch how the Orangutans is been feed in the wildlife centre. Taking photographs with the Orangutans. Learning the lifestyle and rehabilitation of the Orangutans. Jungle trekking in the Natural Reserve and opportunity to see various birds and plants. Taking the Sarawak Transport Company bus No. 6 or City Public Link – CPL Bus Service K6 from Kuching City (from Jalan Masjid) and it will stop at the main gate of the Semenggoh Nature Reserve. You will see the Semenggoh Botanical Research Centre and a ticketing counter for the visitors to the wildlife centre. You need to take a 20 minutes (1.5 KM distance) walking from the main gate to the Semenggoh Wildlife Centre and Orangutan feeding area where you can see the Orangutans. The bus journey takes around 1 hrs depends on traffic. The departure time will depends on season. Do contact +6082 428 278 (CPL Bus) for further enquiry for any changes in schedule. The time when the bus leaves the centre to kuching City is 11:00 AM and 4:00 PM. If you arrived here by own transport, you will need to pay the entrance ticket at the main gate first before driving another 1.5km to the designated visitor parking area at the Wildlife Centre. Taxi and Grab Car can be another alternative to reach here. However it is easier to reach here than going back to Kuching City. Do take their contacts if you wish for a arranged return trip. Travel Agency is still one of the best choice as it usually include several other side package that compliment the tour as there is many more other places of interest at the Semenggoh – Puncak Borneo area, which includes Annah Rais Longhouse. You won’t be staying more than 3 hours in the wildlife centre considering the short opening hours with a break in between. Furthermore you won’t worry about the transport schedule as mostly it is fixed with the tour packages. The locality map of Semenggoh Wildlife Centre. Orangutans have long been the most iconic species at Semenggoh. Visitors love to come here and see the orangutans living in the wild. The Semenggoh Wildlife Centre was established in 1975, within the 653ha of Semenggoh Nature Reserve, the oldest Forest Reserve in Sarawak. Most of the orangutans in Semenggoh were either confiscated or surrendered by the public. Orangutans that had been kept as pets or been in captivity lost their ability to survive in the wild. When they are sent to Semmenggoh, they have to undergo a series of rehabilitation program to enable them to regain this skill. Since 1978, Orangutans have been released into Semenggoh Nature Reserve on a staggered basis, subject to their ability to adapt to their wild surrounding. In 1996, Matang Wildlife Centre was established as a sister facility to Semenggoh Wildlife Centre in conducting orangutan rehabilitation. Semenggoh Wildlife Centre has successfully rehabilitated and cared for about 700 animals since its establishment. Today, it has evolved from a rehabilitation centre into a observation centre for semi wild orangutans. The customer service centre and souvenir shop at semenggoh wildlife centre. Before proceed to the feeding area, visitors can stop by at the customer service centre and souvenir shop. Here you can read about basic information about the orangutans and their family tree. There are allot of merchandise to choose from at the souvenir shop, ranging from plush toys, key chains to postcards. Taking photos with the orangutans. Orangutan means the man of the forest in English. Orangutans do peel off banana skin when eating it. Orangutans can recognize the feeder through their voice and uniform. Orangutans will come back to the feeding platform when they are hungry. Orangutans can drink milk from water bottle. Infant orangutan has bright circles around their eyes that make them look like they are wearing glasses. Mother orangutans breastfeed their babies. During infancy, baby orangutans cling to their mothers. At the age of 2, infant orangutan will try to eat solid food given by their mother. Dominant male orangutan do not like to see himself in the mirror thinking that the reflection is the other male orangutan. Orangutan are the nature circus performers. They are very agile in the tree canopy. Young orangutans like to play with each other if they met during feeding session. Orangutans build nest in the forest canopy for sleeping and resting. Male orangutan becomes dominant when they have cheek pads around their face. What if you have no luck seeing the semi wild orangutans ? you can still visit the gallery and information center about the orangutans in the wildlife centre which you can learn about the story of the orang utans, including their lifestyle, rehabilitation and activities. The orangutans here also have birth certificates too. The birth certificate of the Orangutans is available at the gallery of Semenggoh Wildlife Centre. There are three feeding platform available around the wildlife centre. Before visitors are allowed to go to the feeding areas, visitors are brief about all the dos and don’ts of the wildlife centre. There is a common area at the bridge house where visitors can sit down and get briefing from the ranger. The Semenggoh Wildlife Centre signage. Attention All Visitors : Never feed or provoke orangutans. Obey the ranger instruction at all times. Although the orangutans may appear tame and gentle, but they are wild. Orangutans are unpredictable and could seriously injure you. Warning signage in the wildlife centre prohibit visitors to feed or provoke the orangutans. Orangutans eats a wide variety of plant species including barks, honey, young shoots, insects, occasional bird eggs, but primarily feed on fruits (60%). At Semenggoh, the food provided to the orangutans includes banana, orange, papaya, pineapple, coconut, sugarcane, sweet potato, milk and occasionally chicken eggs. The bridge and path to the Orangutan feeding area. Do sit down and listen all the instruction from the rangers of the Natural Reserve. They will convey important information such as safety and rules and regulations. Don’t bring any food or drink. Turn off your flash while taking photographs. Avoid standing under the trees with orangutans on them. Keep a distance of at least 6 meters from the orangutans. Don’t use tripods as orangutans might react perceiving tripods as guns or blowpipes. Don’t bring in baby-strollers or wheel-chairs. A short jungle trekking to spot the wild orangutans nesting on the top of the trees. Visitors are not allowed to roaming into the forest without the guide of the ranger. The ranger will try to call out at the forest to signal the feeding time to the orangutans. The orangutans will responds to the familiar calls of the rangers and will proceed to the feeding area if they are hungry. At times the orangutans prefer to ignore the calls and continue to rest at the tree tops, the ranger will bring the visitors to spot the orangutans in the trees. 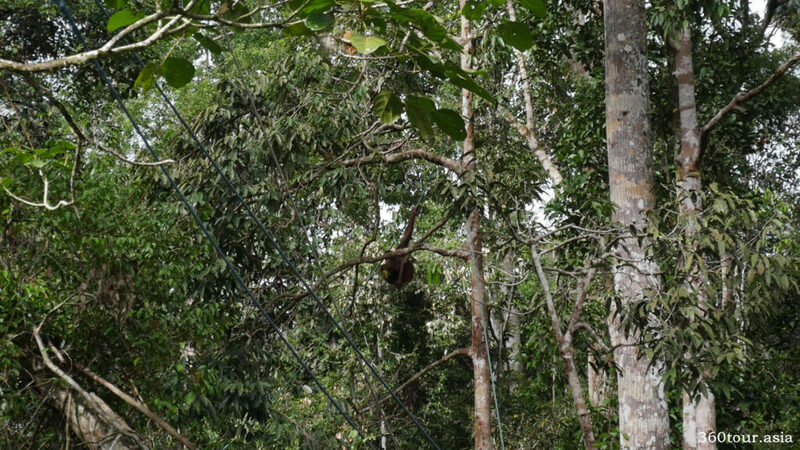 Orangutan swinging around the forest along the rope path. Orangutan’s arms are twice as long as their legs. Orangutans mostly swing around the tree branches to get around the forest. There is also ropes around the feeding area to facilitate the movements of the orangutans around. On the ground, they walk quadrupedally on their fist (fist walking). Orangutan named Ritchie is the dominant male and the ‘Big Boss’ at Semenggoh Wildlife Centre. Ritchie is born in year 1981. He was rescued from the pet trade by a journalist by the name of James Ritchie; thus he was named after his savior. Ritchie, as the alpha male of Semenggoh, rules his territory with an ‘iron fist’, landing himself a fierce reputation amongst other male orangutans, who dare to challenge his stake at Semenggoh’s throne. Allegiance to the ‘big boss’ can be seen in the way of other orangutans moving away to clear themselves out his path. A hot headed giant, he is most happy in the company of female orangutans around him. If he fells a bit under the weather, some facilities might have to face the brunt of his moodiness. Ritchie’s demeanor is seriously bordering to sensitive. He dislikes tripod and umbrella, being teased or provoked, loud noises and being photographed. He does not like seeing his own reflection in the mirror. The ranger set up the feeding platform for feeding the orangutans. During the feeding time, fruits are placed on the feeding platform. Orangutans will come to the feeding platform when they are hungry. This time we are lucky as we can see the alpha of the orangutan of Semenggoh Wildlife Centre in action. Orangutan Ritchie came down and take the feed. Ritchie slowly descent from the trees to the feeding platform and reach to the food. Orangutan Ritchie feeding on fresh fruits. Only the ranger of the Wildlife Centre can close up to feed the great ape. Visitors are advised to stay further away from the orangutans as they might be provoked and attack people that they don’t recognized. Watching how the ranger feeding the Orangutan. Do bring your friends and family to visit this magnificent beast.